Staff Selection Commission (SSC) has released Upper Division Grade Competitive exam 2015 marks detail of the qualified and not qualified candidates who had appeared in the written examination Paper 1 and Paper 2. SSC has also released MARKS OF THE CANDIDATES REJECTED IN PAPER-I DUE TO VARIOUS REASON on the official website on 17th February 2015 for U.D. 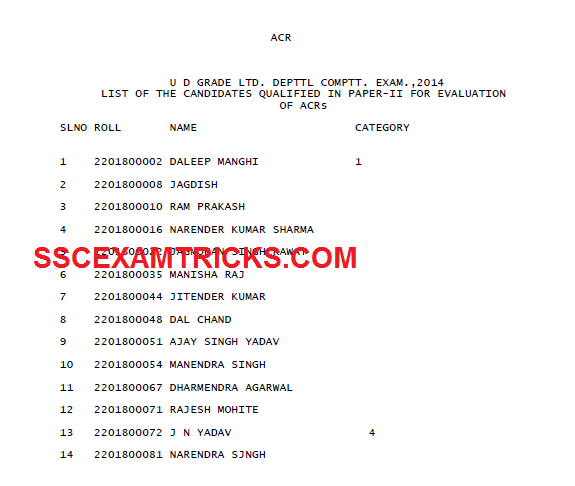 GRADE LTD. DEPARTMENT COMPETITIVE EXAMINATION,2014. Earlier SSC has releaseed result / Marks details of Upper Division Grade Limited Departmental Competitive Examination of Paper 1 & Paper 2 which was conducted on 21st December 2014 at DELHI, ALLAHABAD, MUMBAI, BANGALORE, GUWAHATI, KOLKATA, CHENNAI, CHANDIGARH AND RAIPUR for making additions to the Select List of Upper Division Grade of in Central Secretariat Clerical Service, Armed Forces Headquarters Clerical Service, Railway Board Secretariat Clerical Service, Central Hindi Directorate, M.o HRD, Election Commission of India Clerical Service. SSC has also released the final cut off marks of Paper 1 and Paper 2. The result has released on 13th February 2015. A total of 75 candidates had appeared in the examination in which a total of 14 candidates have qualified Paper 1 and Paper 2 and shortlisted for Upper Division Grade. Total 5 candidates have awarded zero marks in the examination. As per the Scheme of the Examination, the record of service of those candidates who qualify in the Written Examination comprising of Paper-I and Paper-II, will be evaluated. Earlier SSC had released notification no. No. 3/7/2014-P&P-II advertised on 13th September 2014 for Upper Division Grade Limited Departmental Competitive Examination in which candidates were required to send application duly filled in all respects by posts to Regional Director (Northern Region), Staff Selection Commission, Block No.12, C.G.O. Complex, Lodhi Road, New Delhi-110504 through their cadre authorities till 10th October 2014. Many candidates had applied for these posts and appeared in the examination. Those candidates who had appeared in the examination and waiting for result/ cut off marks can download their result from the direct link provided in the end of the posts. · Purpose of Exam - For making additions to the Select List of Upper Division Grade of in Central Secretariat Clerical Service, Armed Forces Headquarters Clerical Service, Railway Board Secretariat Clerical Service, Central Hindi Directorate, M.o HRD, Election Commission of India Clerical Service. The exam was conducted on 21st December 2014. The written examination was conducted by Pen MODE. The Exam was consisted of two papers i.e. Paper 1 and Paper 2. Paper 1 was consisted of multiple choice questions (MCQ) and Paper 2 was conventional paper. Paper 1 exam was conducted in morning session at 10.00 AM to 12.00 AM. Paper 1 consisted of 200 questions of 200 marks from various topics such as General awareness (100 questions of 100 marks) and Comprehension and writing ability of English Language (100 questions of 100 marks) was required to be completed in time duration of 2 hours or 120 minutes. , General Logical Ability, General Hindi, General English, General Mathematics, General Science and Computer Knowledge. The total time duration for Paper 1 will be 2 hours or 120 minutes. Paper 2 will consist of 100 questions of 100 marks from Concerned Subject required to be completed within 2 hours or 120 minutes. Paper 1 exam was conducted in evening session at 2.00 PM to 4.00 PM. Paper 1 consisted of 100 questions of 100 marks from various topics such as (Conventional Type) Noting, Drafting & Office Procedure was required to be completed in time duration of 2 hours or 120 minutes. Quantitative Aptitude by R. S. Aggrawal is mandatory requirement to qualify such tough exams in a very short duration of time. Here, Best books are recommended to the candidates who are genuine and willing to qualify the written examination with in minimum possible time. ENGLISH Tricks by Paramount , SSC Tier 1 ENGLISH by Arihant Special Addition exam oriented & Office Assistant Practice Book by Kiran books will definitely improve their ability and performance in solving Reasoning, English and quantitative aptitude. Click here to download Final Cut off Marks Result of Paper 1 and Paper 2.